With a print run of 3,000 copies and a digital version for 40,000 mail addresses of our TTC NEWS E-Bulletin service, this Supplement seeks to develop a line that includes select products, brands and suppliers. 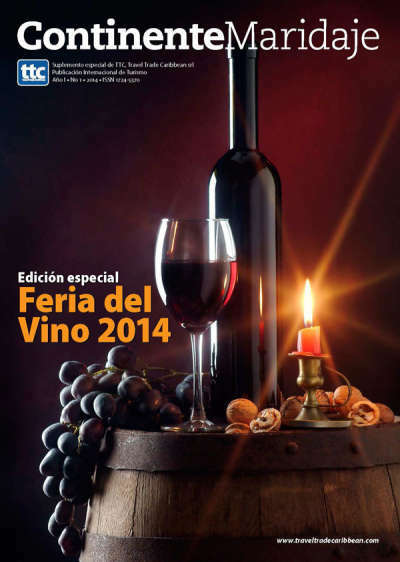 An edition for the 15th International Wine Fair of October 1-3, 2014 will be the first of this line. The first edition of Continente Maridaje will deal with issues like the history of the Festival, interviews with sommeliers; the principal norms for wine tasting, as well as information about the principal types of wine (cabernet, Chianti, etc. ), carbonated, sparkling wines, the difference between champagne and sparkling wine, etc. In addition, it will speak about the history of wine in Cuba and current production; Cuban dishes that incorporate some type of wine, especially dry wine, very much used in Cuban cuisine, among other exclusive information. Note: Clients must deliver their visual identity image to the marketing representative attending them; if they do not have it they must inform it sufficiently in advance to prepare it jointly with the Design and Publication’s Edition specialists.